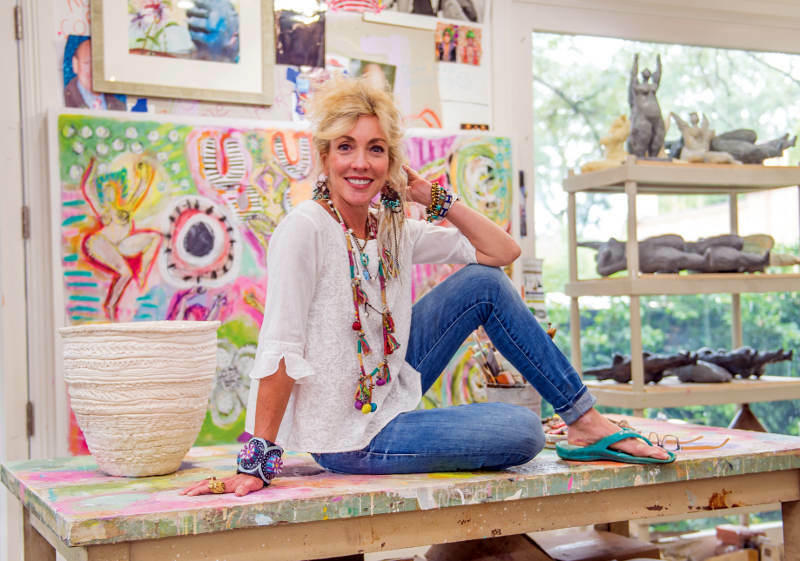 A native New Orleanian, Silvers grew up living Uptown and her mother, Susan Wittenberg, is a well-known local artist. While she was certainly influenced by her mother’s style, Silvers never thought she could pursue art as a career. Instead, she studied liberal arts and received her masters in social work from Tulane University. Art was always her go-to hobby. Growing up, Silvers says her doodles and sketches were often of the female form, which inspired the Rubenesque, sensuous female sculptures — her “Silver Nudes” — that have become her most iconic pieces. During college, Silvers first painted these whimsical women on ceramic plates and sold them at what was then Judy’s on Magazine Street (now known as Judy at the Rink on Prytania Street). When her daughter, now 21, was old enough to go to school, Silvers started painting and began showing at several local galleries. Always abstract, Silvers’ early artwork is more neutral and monochromatic, but, over the years, she has grown to love color. This past summer, after about two decades of working with local and regional galleries, Silvers signed the lease on her own gallery, located at 617 Julia St. in the popular arts district. While she says she had a wonderful experience with many of the city’s most prominent galleries and still maintains strong relationships with their owners, Silvers is excited about the new opportunities ahead. Her gallery’s grand opening coincided with Art for Arts’ Sake on Oct. 3. Though it may be difficult for her to part with her creations, Silvers has sold her work throughout the Gulf Coast, from Texas to Florida, and she also donates art on a regular basis to museums, schools and charitable organizations. Her favorite medium is clay, because it is “more natural and freeing,” but Silvers says she enjoys the challenge of and the satisfaction she gets from completing a painting. Lately she has been incorporating her beloved female forms into her paintings.